Merlyn Rees, later Lord Merlyn-Rees of Cilfynydd, has died at the age of 85. He became Home Secretary in 1976. Before this, he spent two-and-a-half years in the Cabinet's hottest seat, that of Northern Ireland Secretary, a longer tenure than any minister before him. 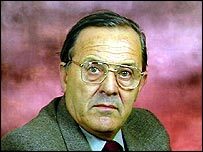 Born in 1920 in South Wales, the son of a miner, he was educated mostly in London and after wartime service in the RAF spent 11 years teaching economics and history at Harrow Weald Grammar School where he had been a pupil. While at Harrow he was an unsuccessful candidate in three parliamentary elections. He joined the Labour Party headquarters to organise the 1962 Festival of Labour and then, after a brief return to teaching, entered the Commons to represent South Leeds following Hugh Gaitskell's death. Rees was then 42. 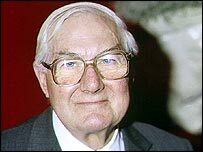 His earliest mentor at the Commons was James Callaghan, who remained a close friend. Mr Rees was his Parliamentary Private Secretary when he was Chancellor and later rejoined him as a Minister at the Home Office - in between, he held offices at the Ministry of Defence. It was when Labour was in opposition that Mr Rees began to specialise in the affairs of Northern Ireland and he became the front bench spokesman with a place in the shadow cabinet. He was thus a natural choice for Secretary of State with Labour in office. By common consent, it was the most sensitive and physically the most gruelling Cabinet job. He took over just after the start of an administration in Northern Ireland in which Protestants and Catholics were sharing power; not long afterwards, it was toppled after a crippling two-week strike by loyalists. Mr Rees brought in legislation to establish an elected constitutional convention to try and agree a future form of government. It failed and he disbanded it in March 1976. Meantime, he had needed shrewdness in dealing with the tactics of the Provisional IRA in declaring a ceasefire, which operated for most of 1975 but which did not stop the violence. Mr Rees was accused from time to time of making conciliatory gestures to the IRA, for instance by permitting contacts between civil servants and Sinn Fein. But much more bitterly criticised by most Northern Ireland unionists and by Conservatives at Westminster was his policy of releasing from prison all detainees held without proper trial. He nevertheless pursued this until detention was ended in December 1975 after 2,000 men and 33 women had served terms. Most of the time, however, Tories in the Commons gave their support to a generally bipartisan policy and Mr Rees' efforts were much more favourably assessed in Britain than in Northern Ireland. He was helped by a steady improvement in co-operation between the London and Dublin governments. There were some who thought he became too emotionally involved with the effects of the violence but none doubted that he cared deeply about Northern Ireland. He had to deal with a succession of political and military crises and came under attack at different times from virtually every political sector. Unlike any other minister in normal times, he was constantly under the stress of making snap decisions that could endanger lives. His own life was sometimes in danger too - he once revealed that one of the men he released from detention was a Protestant gunman who had tried to kill him. 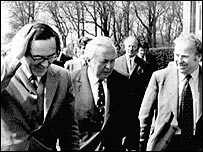 Yet when his friend Jim Callaghan became prime minister he declined promotion and insisted on staying in his post, which he did for several more months until his appointment as home secretary when Roy Jenkins resigned to become President of the European Commission. While at the Home Office he set up a major inquiry into the prison service, but Labour were out of office by the time the committee reported. Mr Rees continued to speak on home affairs from the Opposition benches, but in 1981 he became Shadow spokesman on energy. As one of Labour's elder statesmen, he also chaired the parliamentary group calling for the investigation of Nazi war crimes, and was President of the Video Standards Council. He was made a peer when he left the Commons in 1992, changing his name by deed poll so that he could be called Lord Merlyn-Rees.